White moon gardens have long been the rage for night owls and moth watchers alike, but there's nothing like a tangy burst of lemon drop, gold, and canary to give gardeners a reason to get out of bed in the morning. Whether you prefer creamy dreamy sherbet yellows, radiant sunshine colored petals that make you squint your eyes, or deep gold blossoms that mirror the sky at sunset, there are many floral choices to please those who love the yellow side of the color wheel. The staggered heights and textures of this summer border have the green thumbprint of a horticultural professional, and yet the plants are easy to grow for the average homeowner. Start with the daylilies as shown in the foreground, and choose from a number of vigorous yellow cultivars like the everblooming 'Stella De Oro,' the late season fluffy 'Double Sun,' or the giant fragrant 'Frozen Jade.' Tall spikes of Verbascum (mullein) and foxgloves draw the eye to the center of the border. Finally, deer-resistant and drought-tolerant Genista lydia is an underused shrubby plant smothered in yellow flowers, and available from Proven Winners as the 'Bangle' cultivar. Although formal gardens aren't often noted for their exuberant flowers, sticking to one hue from the color wheel and limiting plant selections can keep the garden as elegant as any that only feature foliage. The flowering plants in the foreground belong to lady's mantle and old-fashioned plant that will grow almost anywhere. In fact, when grown in its preferred habit of moist soil and partial shade, lady's mantle can self-seed excessively, so feel free to pull up unwanted volunteers. The rose specimen in this garden is 'Golden Wings,' a fragrant shrub rose that grows up to six feet tall. The simple five-petaled single form of this rose attracts butterflies, which appreciate the exposed stamens in the blooms. Leave the spent roses in place if you want to enjoy the large orange hips that appear in the fall. The gold spires in the center of the photo are lupine plants, which grow best in areas with cool summers. If that doesn't describe your garden, replace them with non-fussy Baptista 'Carolina Moonlight' plants instead. Only yellow flowers will do after months of dreary gray skies and dirty snow on the ground. Choose a yellow tulip variety that perennializes reliably, like 'Golden Apeldoorn' Darwin hybrid tulips, with very large blooms held aloft on two-foot stems. Primroses happily fill in the gaps, growing in the same cool, moist conditions that tulips appreciate. When the landscape heats up, many gardeners turn their thoughts toward watering needs. By grouping plants that have similar irrigation requirements, gardeners can reduce disease problems that come from over-watering, as well as save on water bills. All coreopsis varieties, including the long-blooming 'Moonbeam' cultivar, tolerate moderate to severe drought conditions when established. Installing a soaker hose or drip irrigation at planting time further reduces water usage by delivering moisture at the root zone where plants need it most, instead of spraying into the air where wind and evaporation whisk moisture away. Just in time for the welcome russet and gold tones of autumn, black-eyed Susans and marigolds are at their finest. The 'Goldsturm' black-eyed Susan pictured was named as the 1999 Perennial Plant of the Year due to its fast growth rate, heat and humidity tolerance, and long bloom time. The 'Lemon Gem' marigold pictured makes a great companion for a yellow-themed garden as they will keep blooming right up until frost, given a light shearing when blooms grow sparse. Sunflowers like the early blooming 'Del Sol' bring smiles to children and adults alike, but the leggy stems can look unattractive in the border, especially when trying to incorporate the statuesque beauties in the front yard garden. The yellow daisy Leontodon rigens combined with sprawling gold nasturtiums ('Strawberries and Cream' or 'Milk Maid') guarantees that no unsightly stalks will detract from your yellow flower garden design. Other yellow flowers that make good sunflower companions include 'Canary Bird' zinnias, 'Antigua Yellow' African marigold, or 'Prism Sunshine' petunia, an All-America Selections winner. An average potting shed becomes a focal point in the landscape with the addition of yellow cottage garden flowers and a shallow stone canal (or rill) with a footbridge. In addition to yellow-flowering plants like 'Moonshine' yarrow, tansy, and ligularia, this garden adds a jolt of yellow with golden foliage plants like golden hops vine (Humlus lupulus 'Aureus') and hemlock 'Everett's Golden' (Tsuga canadensis), which will slowly mature to a manageable eight feet in the garden. As the RHS Chelsea Flower Show demonstrated in a display, viola and chamomile flowers make pretty container companions. Although golden chamomile (Anthemis tinctoria) is an herb, it isn't the same flower used in relaxing tea preparations as German chamomile (Matricaria chamomilla). Rather, the value of golden chamomile as an herb lies in its pigment when used for dye. When is a flower also an herb? While botanists define herbs as seed-bearing plants with fleshy parts, The Herb Society of America describes herbs as "plants valued for their flavor, fragrance, medicinal and healthful qualities, economic and industrial uses, pesticidal properties, and coloring materials (dyes)." Other yellow-flowering plants valued for the herb garden include dill, calendula, and roses. Violas, on the other hand, are widely used in culinary preparations. Unlike some other flowers that are widely touted as edible (nasturtiums, anyone? ), violas actually taste pretty good. The flavor of a fresh viola is said to range from sweet to pea-like, and violas bring fresh beauty to tea parties and weddings when crystallized with sugar. Viola leaves are edible as well, making a tender and tasty addition to spring salad mixes. Talk about beginning the season with a bang: These yellow standouts include helenium, santolina, rudbeckia, dahlia, euphorbia, with an exclamation point of kniphofia in the center. 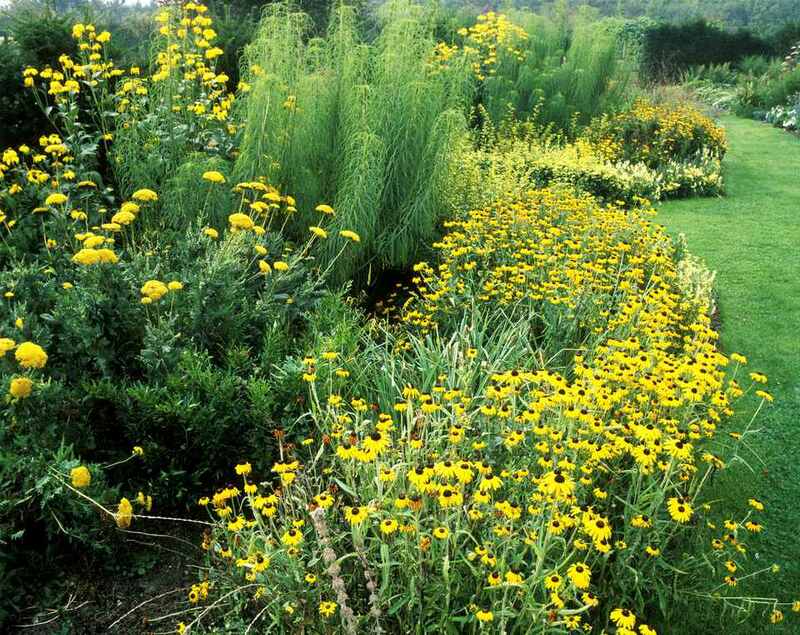 Weeds can sneak into a tightly packed border like this and grow rather large before detection, so gently move plants apart and peek between plant groupings to ensure that no dandelions are masquerading as one of your yellow favorites. Sometimes gardens that grow in full sun from dawn until dusk can appear washed out, but many flowers can endure 12 hours of unfiltered sunshine without bleaching or browning. The perennial yarrow (Achillea filipendula) 'Cloth of Gold' with helenium 'Zimbelstern' will fill your vases from early June until the end of August with picture-perfect blooms that will last up to two weeks as cut flowers with proper conditioning. Landscaping a large area with rock mulch is a smart water-saving move in dry climates and fire-prone areas, but punctuating the rocks with some bright yellow flowers can prevent your yard from looking barren. Try groupings of the low maintenance, drought tolerant Colorado Gold treasure flower (Gazania linearis) pictured here, or experiment with the desert yellow fleabane ( Erigeron linearis) or the yellow hardy iceplant (Delosperma nubigenum) to achieve a garden similar to this one. A rock garden is more than just a garden filled with rocks; true rock garden plants demand sharp drainage and will succumb to rot in soggy spring soils or with excessive irrigation. If your soil is characterized by heavy clay, don't try to improve the soil across the entire area; just focus on the planting zone around each plant you install. Dig a hole two to three times bigger than the nursery pot, and backfill it with potting soil mixed with gravel or grit. Gardeners covet David Austin English roses for the old-world perfume, high petal count, and reblooming characteristics. 'Graham Thomas,' introduced in 1983, quickly became a bestseller among English roses. You can train this vigorous shrub as a climber, or place it at the back of the summer border where it will shine in growing zones 5-8.